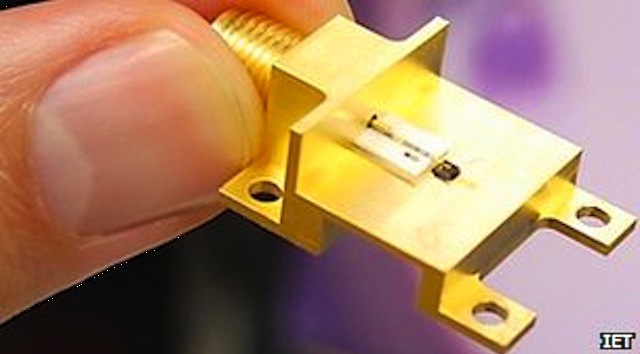 tl;dr Researchers set new record with world's first terahertz-band WifI -- 3Gbps. That's a big bump over the 'blisteringly quick' 1.5Gbps recorded last year. Who accomplished this feat? How'd they do it? What are 'terahertz', anyway? How much time would this save if using home WiFi to download every episode of 'Game of Thrones'? And the really important bit: what's the catch? A team of graduate student-researchers at Tokyo Institute of Technology (JP), working in the school of Science and Technology. Want to meet them? You might attend the presentation they've scheduled for the 3rd European Optical Society Topical Meeting on Terahertz Science & Technology. The event runs 17 - 20 June at Kaiserstejnsky Palace, Prague, Czech Republic. Radio frequencies from 300GHz to 3THz are classed as the terahertz spectrum. Comparing this range with what you use (even if you don't know it) in your current devices, 300GHz is 60x higher with 3THz a further 10x above that. Pulling out our handy NTIA Frequency Allocation Chart (pdf), we learn this band lies smack between between microwave energy and infrared. But what's more interesting is that the terahertz band is not yet regulated...by any country. 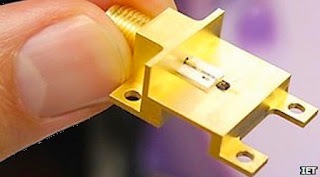 The terahertz band has seen little usage outside of research settings, tho' it has lately been promoted for imaging devices. Terahertz waves pass through most materials (even thin masonry), yet seem to cause less harm than X-rays. How did those Japanese whiz kids do it? The simple answer: they switched to higher frequencies. It's not a new idea. But previous attempts have run up against the usual problems involving power-efficiency, cost and size. It's little help reaching high speeds if the device ends up being too big for our routers, cellphones, and laptops. This little guy will put your old router out of business. ...barely visible, here, on the business-end of that thing he's holding. In addition to vibrating (thus, the 'resonant' part), RTDs have one very interesting electrical characteristic: as the input current is increased, voltage at the diode can drop. Anyway, it worked. The team saw ~10x more output power, produced at significantly higher frequency than what's used today (400 GHz). In fact, the RTD device functions across a wide range of frequencies, from 542GHz up to 963 GHz. 3Gbps is so much faster than any current wireless service, it's hard to describe. Think of it this way: broadband service in the USA averages ~6Mbps. Compare this with the United Kingdom at ~5Mbps and Japan, ~8Mbps. Top honors go to the Republic of South Korea, with their remarkably fast 16Mbps service-average. Note how those speeds are expressed in Mbps -- 'megabits per second'. 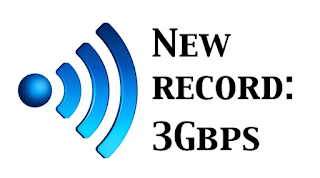 The new record is 3Gbps -- 'gigabits per second'. And 1 gigabit = 1,000 megabits. So we're talking about WiFi many times faster than even the best cable Internet service. Yeah, we know -- there's always a catch. Output-efficiency is so-so, with a current broadcast range of only 10 meters (~30 ft.). The team said they are working to boost that via an external antenna. Still, 10m is far enough to get signal from a router to your computer or TV. Then come the inevitable delays due to bureaucratic red tape, like haggling over standards and regulatory issues. For today's top WiFi (802.11n), this process took -- oh, seven years. And we're still awaiting the first 802.11ac, 1GHz+ devices. The good news is that we might soon be able to end that cycle. In theory, terahertz-band WiFi can support throughput speeds up to 100Gbs. That's more than enough to cover most wireless transmission scenarios for many years to come. So, someday soon -- preliminary hardware could be ready by next year -- you could be downloading at speeds ~20x faster than 2012's consumer-level devices. Today's 1-hour download would take only 3 minutes. Maybe less. Not sure about you, but MobilePhonesFan thinks it's worth the wait.